Are you in Berlin on May 25? Don't miss ANEWAL's concert on that day at Werkstatt der Kulturen. ANEWAL is the new trio of Alhousseini Anivolla, lead guitarist and singer of internationally renowned desert blues band Etran Finatawa. Formed in 2014 ANEWAL brings traditional African tunes into new acoustic soundscapes. Hypnotic two-chord jams, trance-including beats, biting blues-infused guitar and Anivolla's warmly laid back vocals sung in his local vernacular. Anivolla is an incisive and remarkably subtle guitarist, varying his attack on the strings, adding minute levels of natural distortion, his incisive, blues-infused phrases ringing out over long, swaying vamps. 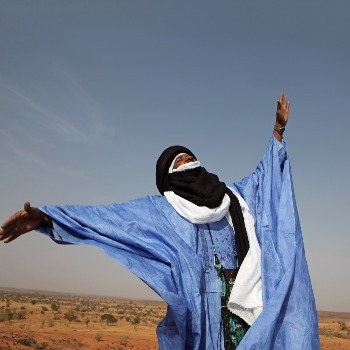 ANEWAL´s concert is a splendid show that leads the audience right into the desert and an actual African scene.